Royal Portrush and Portrush itself. . . . The town beyond the golf never gets old. Ordinarily, I love to walk when I play golf. One of my fondest memories is of carrying my own bag around the Old Course at St. Andrews in 2013. And parring the Road Hole. But I developed a pretty serious knee problem about a month before we left for Ireland. And despite a solid month of rehab, it remained sore. I hobbled around with a “trolley,’’ as pull-carts are called across the pond, for three of our first four rounds. But the hills of Portstewart left me pretty wiped out. 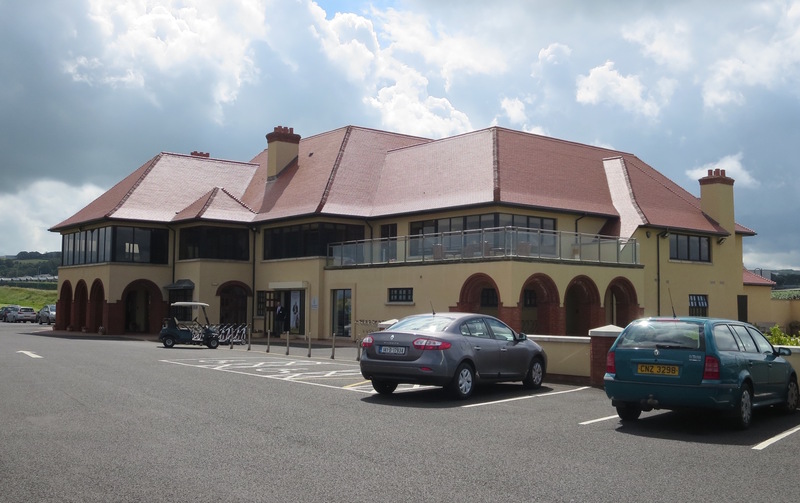 The next day, when we saw a “buggy,’’ as riding carts are known over there, sitting outside the pro shop at Royal Portrush, I asked if I might be able to ride because of my knee. 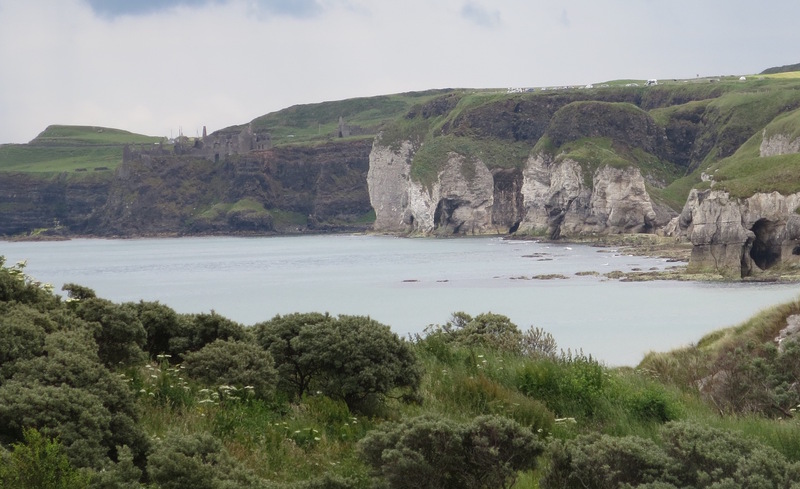 The white cliffs, right, and the Dunluce Castle, left, provide the view from the far side of Royal Portrush . They said I would need a doctor’s note. Fortunately, I had brought one along. When I pulled it out, the woman in the pro shop said she didn’t need to see it, but explained that I would need to hire a driver/caddie. And so, Liz, who was happy to walk with a trolley, and I found ourselves on the first tee at Royal Portrush, with me riding shotgun beside my driver/caddie, Paul, in our buggy. Like Royal County Down, Royal Portrush, a 1929 Harry Colt design for a club that was formed in 1888, is a big stage of a golf course. It hosted the 1951 British Open, the only Open not played on the U.K.’s main island. Portrush also is scheduled to be the site of the 2019 Open. Royal Portrush ranks 15th on golf Magazine’s top 100, and 16th on Golf Digest’s best courses in the world. That made it the third and final top-100 course on our tour of Ireland. The “caravans,” or mobile homes, have a nice view of the second tee at Royal Portrush. Standing on the tee, Liz and I were excited. Royal Portrush is another starkly beautiful seaside links course. Natural and inspiring—and a little intimidating. 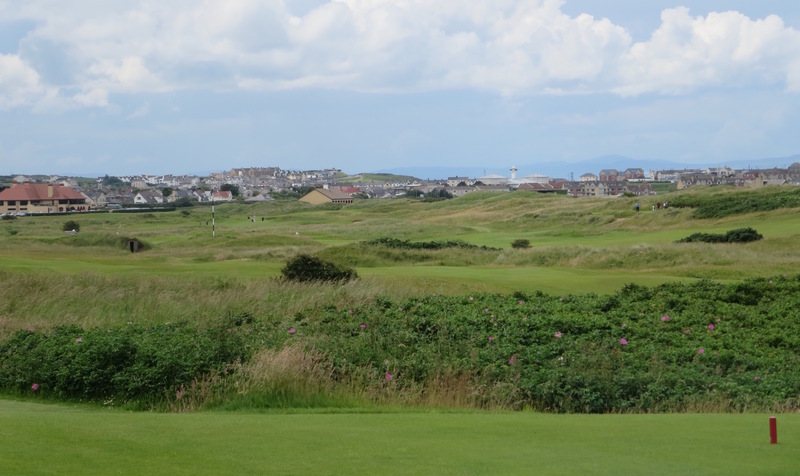 Portrush lies somewhere between Portmarnock and Royal County Down in overall feel. It’s in between the other two in terrain changes—more hilly than Portmarnock but not as up and down as County Down, particularly at the beginning of the round. From the higher ground, Portrush has splendid views—of the rocky coast and Dunluce Castle looking away from town, of Portrush and the clubhouse looking back toward the first tee, and of Portrush’s second course, the Valley Links, looking out toward the sea. 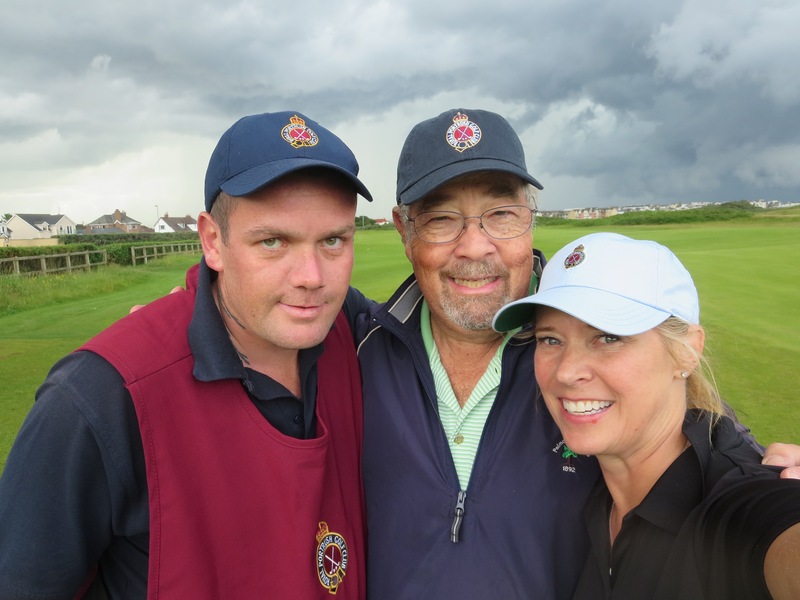 Liz and I and our caddie/driver, Paul, grab a quick selfie before the heavens erupt. Paul called the Valley Links “G-Mac’s course,’’ a tribute to Graeme McDowell, who is the pride of Portrush along with Open champion Darren Clarke. Paul grew up competing against G-Mac, mainly on the Valley Links, and has fond memories of those days as well as McDowell, one of the most humble and likable players on tour. Paul was equally patient with my flails, although he did optimistically give me tips designed to help me stay down and swing through, a fundamental I have disregarded for decades. I did manage to punch something through the wind on the par-3 third hole, listed at 140 yards but playing much longer into the wind, for a par. On No. 5, a dogleg right, Paul did a nice job of finding my tee shot in the heather, and I salvaged bogey. 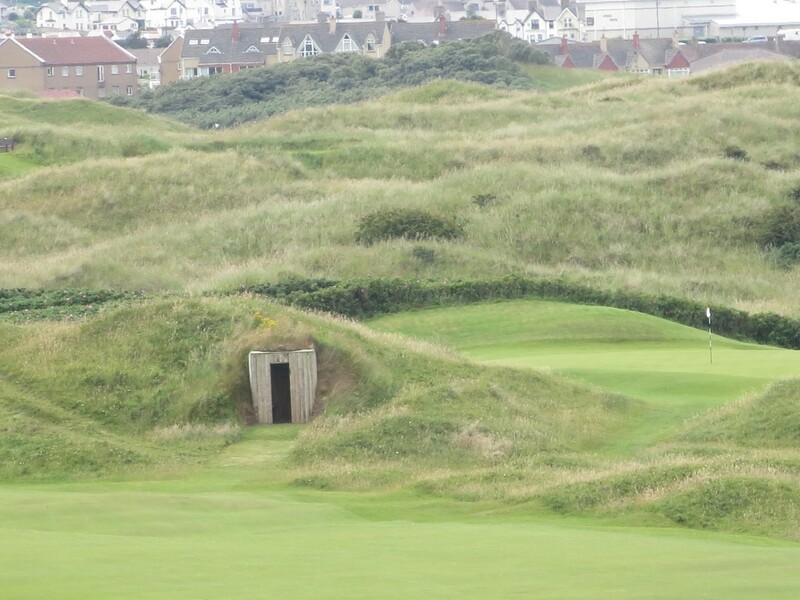 Every hole at Royal Portrush tells a story, but No. 14, a 200-yard par-3, will will attract a lot of attention when the Open is played there. The 14th derives its name, Calamity Corner, from the cavernous ravine to the right of the green and the fescue-laden hills to the left. It’s an island green, Irish style. Paul’s sharp eye found my short-left tee shot in the grass, and a firm pitch-out again saved bogey. We played Calamity Corner with the wind. Usually, it plays into the wind. And with the tee likely to be pushed back for the Open, No. 14 figures to live up to its name. When the weather’s rolling in, it’s time to hit and run. 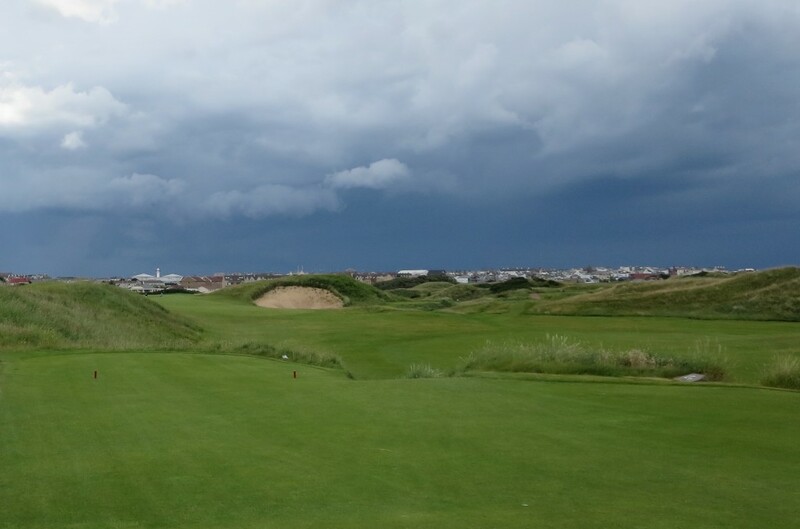 Dark clouds loomed ominously in front of us as we trundled back toward the clubhouse, and we quickened our pace. We had mostly dodged the rain during our first week in Ireland, so no complaints. But great course or not, we were in no mood to dawdle, especially when we heard a couple of rare (for Ireland) cracks of thunder. “It’s quite an angry sky, isn’t it?’’ Paul said several times. Each time, I agreed. No. 16, a longish par-4, is called Babington’s, “named after a famous hanging judge,’’ Paul said. Two bunkers guard the corner of this dogleg right. But we were aided by a strong trailing wind, and I was pleased to be pin-high in two after dodging two fairway bunkers. With the sky growing increasingly ominous, we hustled through No. 17, where the wind helped me to a routine par. No. 18, we were into the wind, but aided by plenty of extra club, i managed a speedy bogey. 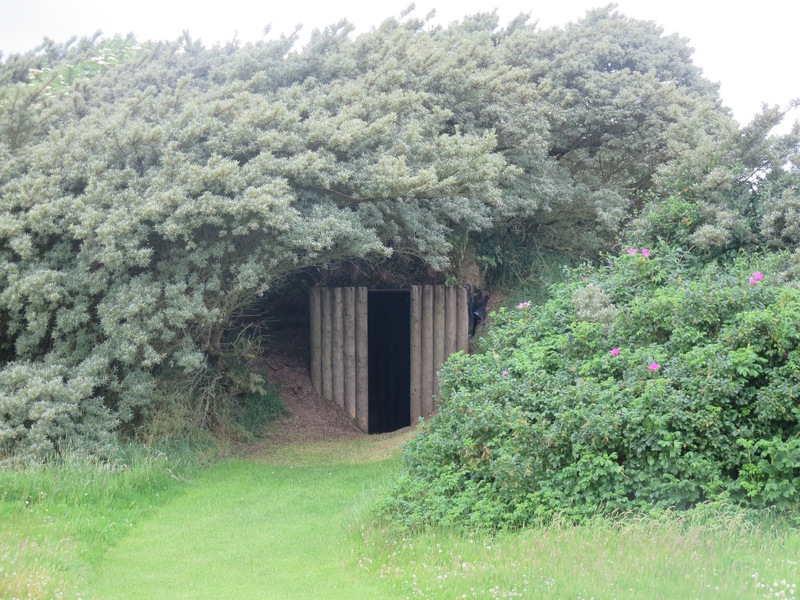 Gimme shelter, Part 1. . . at Royal Portrush, there are ways to beat the weather.
. . . Gimme Shelter, Part 2. Portrush style. Gimme Shelter, Part 3. . . Any Portrush in a storm. Still moving quickly, Liz and I found ourselves in the clubhouse watching the heavens erupt. 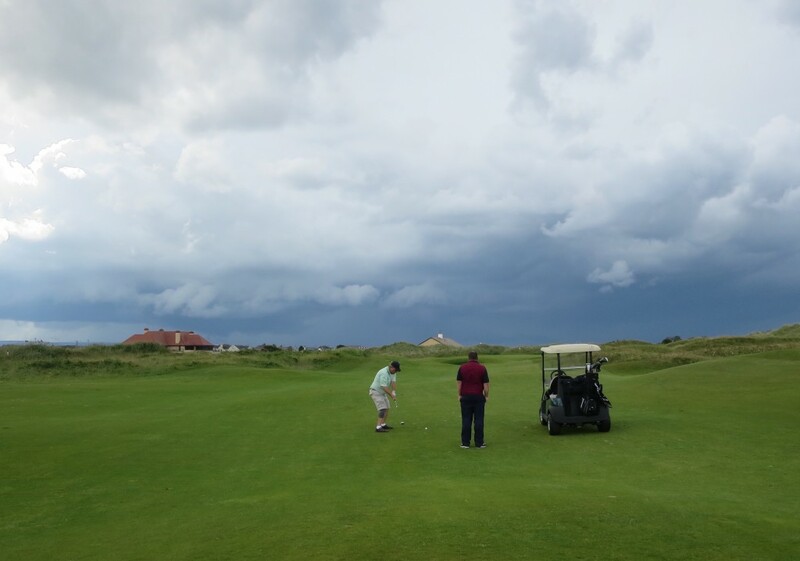 We felt sympathy for those caught on the course under a dark sky and pelting rain. But we were glad to have moved on to Guinness and a cup of soup. In the clubhouse, we chatted with a gentleman who had opted not to take a chance on the weather that day. 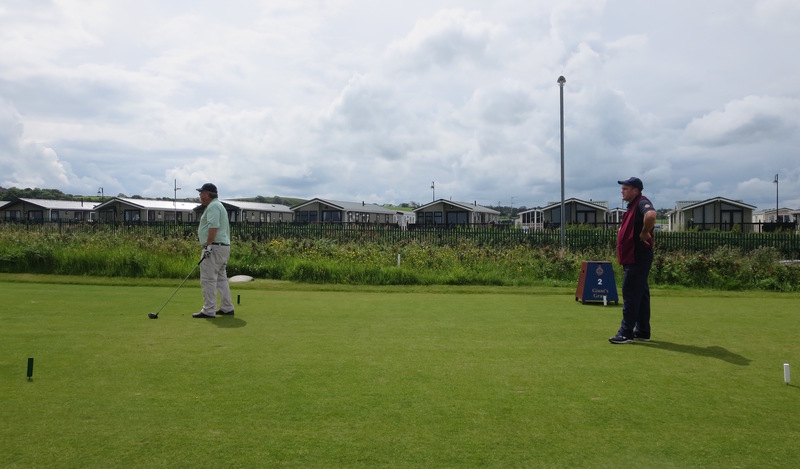 A member who lived less than an hour from Portrush, he spent a big chunk of summer in one of the “caravans,’’ or mobile homes, across the road from the golf course. 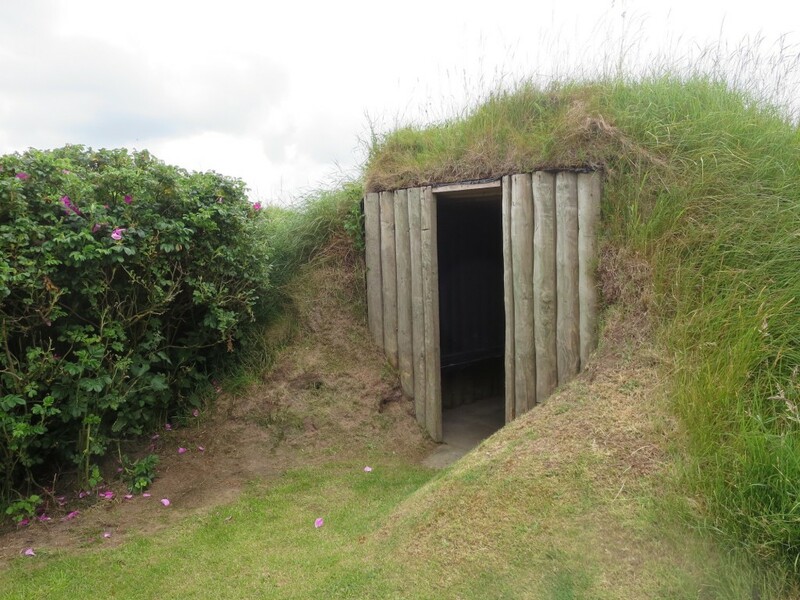 Golfers are advised to `Avoid Big Nellie,’ the massive bunker on No. 17–especially on when a storm is rolling in. In the United States, a fancy club would look down its nose on mobile homes adjacent to a historic golf course. But caravans are a popular convenience in the British Islands. I also remember seeing a caravan park adjacent to Ballybunion. It’s another practical side of golf across the pond, where you don’t have to be a millionaire to play some of the world’s greatest golf courses.